We stock a wide range of instructional fire door signs for the workplace. 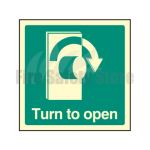 From ‘fire door keep shut’ instructions to how to open the door instruction signs, we have a selection of door signs that will help your staff find their way out of the building in the event of a fire. We have a range that will suit your needs. Our fire door signs are photoluminescent so they can be seen in dark of harsh lighting environments. Our signs are made from a rigid plastic and while they are durable, they should only be used indoors. Signs can be stuck to the wall using double sided tape. If there is a sign you desire and can’t see on our website please get in touch with our sales team on our Freephone number: 0800 316 0890 as they may be able to assist with your enquiries.